Okay, okay - I know, don't judge me. This isn't a 'skinny' recipe - I just had SO many blackberries and thought this would be a good thing to try. Plus with jam, you only use a little at a time. Everything in moderation, right? If you substitute the sugar and try it - let me know how it turns out! I found this recipe over at Repeat Crafter Me! If you know me, you know that I LOVE using the crockpot. There was one time during the school year that my co-workers would ask me everyday what I had cooking for dinner in the crockpot that day. I got a triple crockpot last Christmas so I can crockpot cook multiple recipes at the same time. When I saw this recipe and saw that it involved the crockpot, I was all for it! 1. Lightly mash the berries in a large bowl with a pastry blender or potato masher. It'll be chunky. 2. 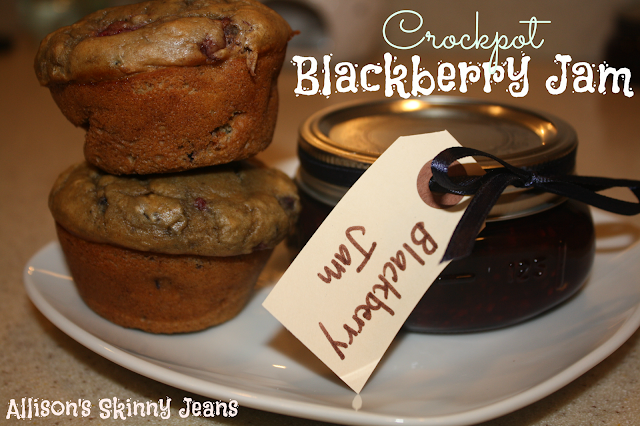 Add the blackberries to the crockpot and add in 2 cups of sugar and 3 tablespoons of lemon juice. Mix together and cook on low with the lid on for 2 1/2 hours - stir twice during this time. 3. Remove the lid and cook on high for another 2 hours. 4. After that, I added an extra 1/2 cup of sugar and 1/2 tablespoon of lemon juice and let it cook for another 30 minutes. If it seems too thin, add more sugar & lemon juice. It will thicken some as it cools. It won't have the same consistency as store bought jam, but it'll taste better! 5. If you prefer seedless, use a sieve to strain out the seeds. I made 2 jars with seeds and 2 jars seedless. There aren't any preservatives, so it should last about 6 months canned, or 2 months in the refrigerator. I got these adorable wide mouth jars from Wal-mart. Add a tag and ribbon and it makes for a perfect gift! Try it on some Blackberry Cobbler Bread! Or some Banana Blackberry Muffins! YUM! I love blackberries! My family makes blackberry jelly, but I may have to try a jar or two of this next time! This looks delicious! Thank you for visiting my blog. I like the title of yours, and since I am trying to eat healthier and lose weight (so hard! ), I am following you. Have a great week! Allison, thanks so much for linking this great recipe to the In and Out of the Kitchen party. I will be using this recipe either today or tomorrow! I belong to a CSA and will be picking up blackberries this morning! Found you at In and Out of the Kitchen Party. I am loving this recipe and pinned it! Looks like I probably have another two weeks to find some cute jars like you have! I will be ready for all my blackberries when they ripen. I'm always excited to have new followers! Please let me know how your jam turns out! I found my jars at Wal-mart in a pack of 4. Send me pictures! Thank you for stopping by and leaving a sweet comment. Your comments are set to noreply...not sure if you realized that. If you aren't getting replies to your comments, that is why. Just wanted to let you know that your blackberry jam received the most clicks at the In and Out of the Kitchen Link Party. You and your recipe will be featured at the Top 10 Favorites post that goes live on Monday morning and at the next I & O party! I'm so excited to be featured! Thank you so much! I'm thinking you may had as many blackberries as we had. I felt like all I was doing is picking, washing, and freezing. I actually had to stop picking because I couldn't keep up! This jam recipe looks awesome (mainly because it is done in the crockpot!). Thank you for sharing, I'm off to check out your other blackberry recipes. That's definitely how I felt! Washing & freezing was quite a chore! I LOVE crockpot recipes - let me know how it turns out of you use it! Just wanted to let you know that my jam turned out perfect and so tasty! I also wanted to let you know that your recipe was the most clicked at the In and Out of the Kitchen Link Party. You will be featured at the next party and in the Top 10 Features post that goes live on Monday morning! I made this for the first time today with half Stevia, half sugar....it turned out great! I can't compare it to sugar-only but it was for sure yummy! Thanks for the recipe!